click here to listen to music from the film "The Titanic"
Follow our link on the fish to find out more information about Coral Reefs. -Never stand, sit or rest on living coral. Despite having hard skeletons, part or all of the colony may die from infection if the delicate outer soft tissues are injured. - If you are diving or snorkelling, and need to steady yourself, use your fingertips on bare rock and leave your gloves behind. - Don't touch, move or molest animals for amusement or photography. - When in a boat be watchful of reefs when anchoring. Polaroid sunglasses make it easier to pick out seabed features. Find a sand or rubble patch and then drop anchor. - One pint of oil can produce an oil slick that will cover one acre (approximately the area of a football field). - One part of oil per million parts of water (about equivalent to one drop of oil in a filled bathtub) can produce tastes and odours noticeable to humans. - 35 parts per million can cause a visible oil slick on water and can damage aquatic organisms. - 50 parts per million can foul water treatment plants and cause equipment damage. - Oil in landfills can leach into ground water, carrying contaminanats and affecting the odour and taste of the water. 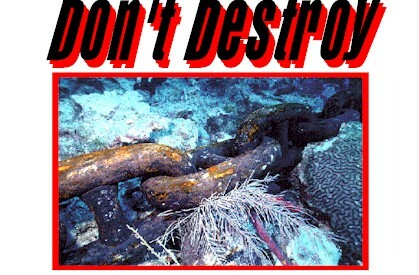 - Plastic, and other garbage thrown in the sea, harms and kills reef life and coral reefs. Let's protect our environment together! Follow this link to the mother.jones.com Action Atlas and see how in Cayman we have made/and are making provisions to protect our coral reefs. Please also study what is happening to the world's coral reefs! Follow the links to the motherjones.com Action Atlas to check out if our neighbours' (Jamaica and Cuba) coral reefs are as healthy as ours in Cayman! 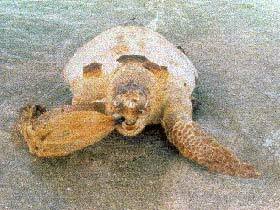 This turtle was found with a plastic bag attached to it. Remember don't dump in the sea or you will destroy our environment!